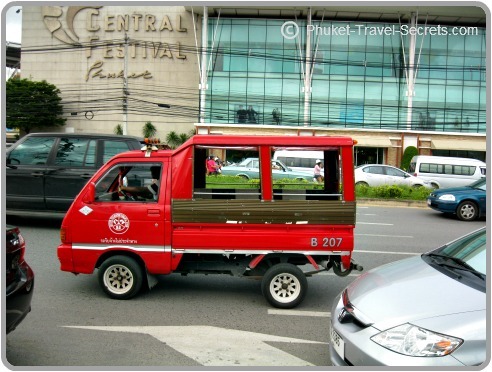 Tuk Tuks in Phuket are a popular mode of transport, and you won't have to look to far to find them. These little vans are everywhere on the Island, most of them are painted red but they are also painted in a variety of different colours. They are different from the tuk tuks that you find elsewhere in Thailand as they have four wheels compared to the original ones that only have three wheels. If you are traveling only a short distance tuk tuks are great mode of transport and the kids will love them, although they tend to get a bit uncomfortable on longer trips. Years ago, this was a cheap way of getting around Phuket, however these days they are quiet expensive especially around the tourist resorts. 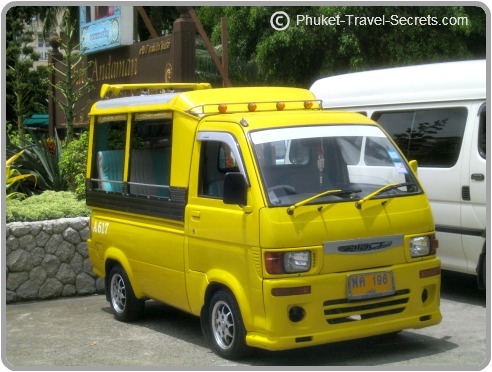 Always agree on the price with the driver before you get in any tuk tuks in Phuket, and be specific on where you want to go. Some of the drivers will try to be tour guides, wanting to take you to places where they get paid a commission or given fuel vouchers for your business. These are prices that we paid for tuk tuks on our most recent trip. We found that If you are not happy with the price that the tuk tuk drivers want you to pay, just smile and keep walking. Some, but not all will come down by 50 to 100 baht. We had to bargain hard for these prices. Bargaining with tuk tuk drivers can be a very frustrating experience, remember to keep smiling and never try to renegotiate the price after you have reached your destination. If you are staying in Karon or Kata and want to go to Patong, the drivers only like to drop you at the southern end of Patong near the Holiday Inn, so they don't have to go all the way into Patong and back out again. All the drivers that we have come across have been friendly and polite and loved showing off their sound systems. 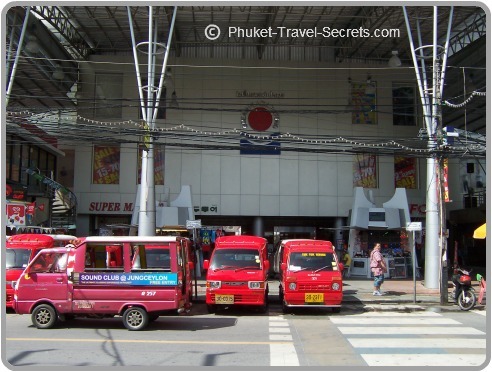 If you want to go into Phuket Town for shopping it is much cheaper to catch the local bus called a songthaew. 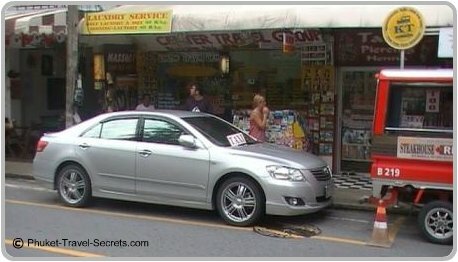 Air conditioned taxi's can also be found around resort area's, the cost of the taxi is the same or similar to Tuk tuks in Phuket, always agree on a price before you get in the car.